Hi there friends, it is so hard to believe that it is April! 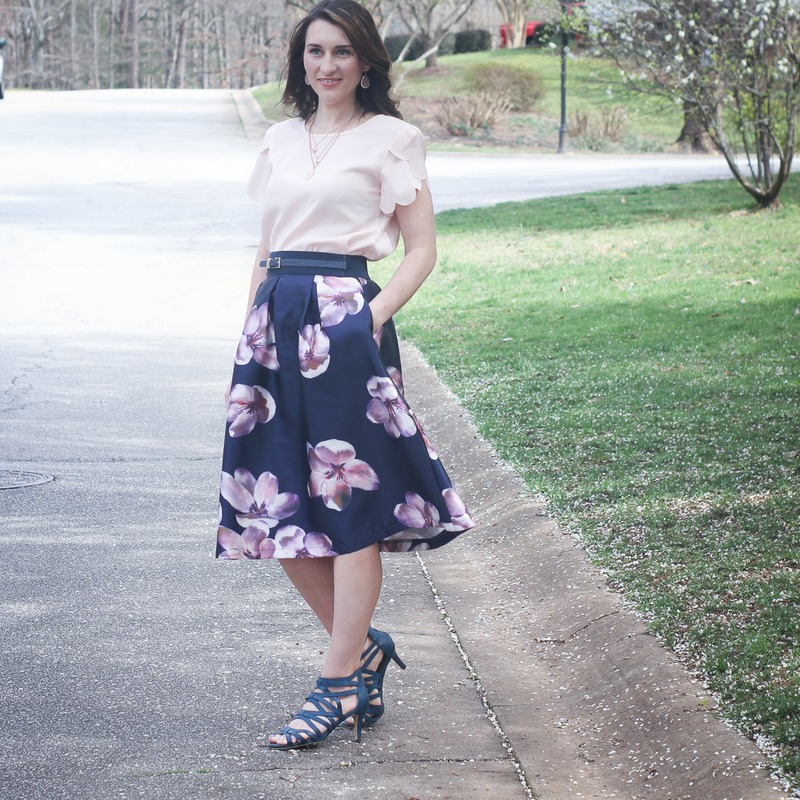 With the warmer weather, comes spring fashion and I am so ready for it! 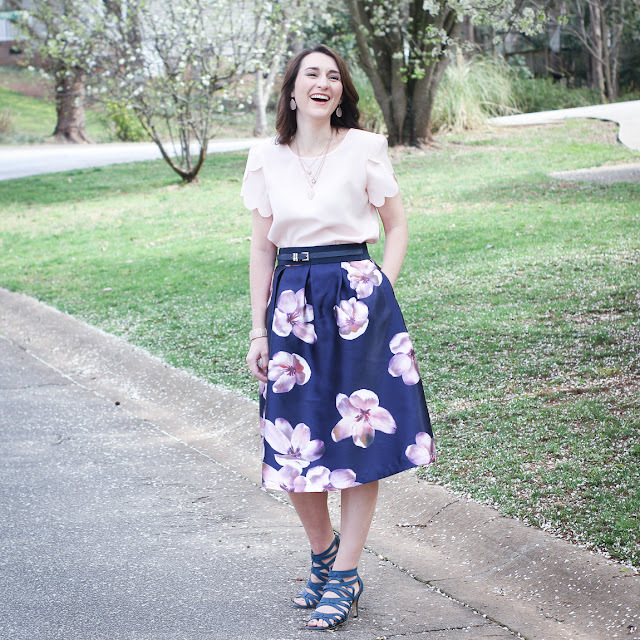 I love florals, skirts and sandals so anytime I can incorporate that into my day, it makes me happy. I picked this midi skirt up from ChicWish and I just adore it! It is work wear appropriate but is also gorgeous enough for a spring wedding. The floral print is so fun and feminine and the colors flow so perfect. 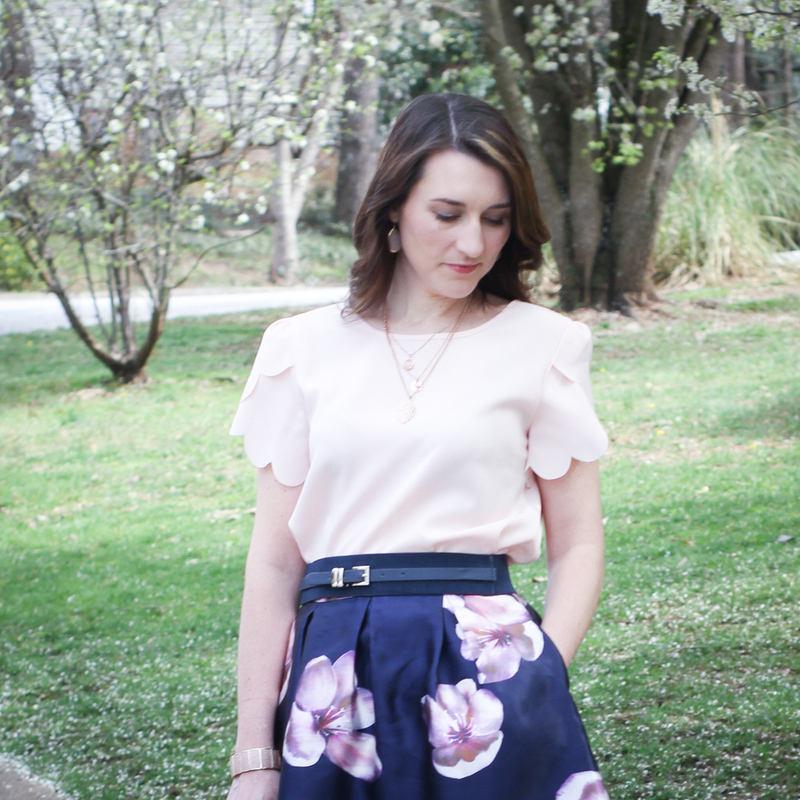 I paired it with a cute tulip sleeve scalloped top in pink. And it is under $10! I threw on a navy belt with it for some added interest. Finally, I finished the look with some strappy heels and rose gold jewelry. 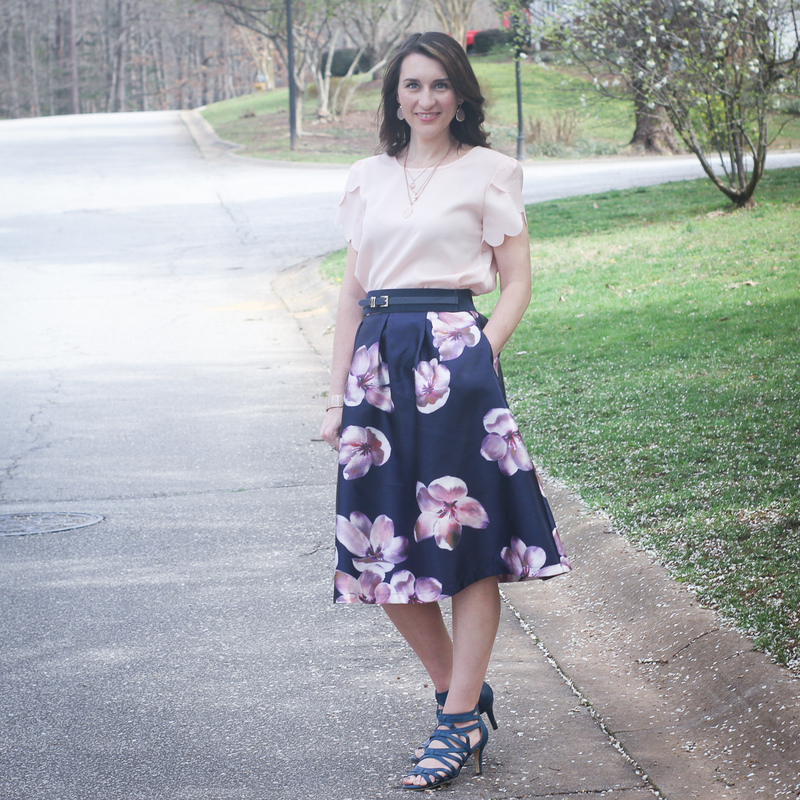 The day we shot this look was a beautiful 70 degree day in Greenville with my friends Jessica and Michelle. We had the best time and basically took over Jessica's house changing clothes every 30 minutes. We got some great shots and I can't wait to share more looks with you soon. I am so thankful for these two ladies. We text basically every day and have become the best of friends. Blogging has brought us together and I am forever grateful for them and our friendship. If you follow along at all on my blog, you know that March was the most difficult month I have ever experienced in my life. It is ironic that the last photo in this post is of me laughing; I haven't done much of that lately. I am still trying to process all the emotions that came with my Mama's unexpected death and it is a struggle for me. It is ironic that the last photo is of me laughing when I don't feel like laughing at all these days. My sister wrote a Facebook post this week that hit the nail on the head. She wrote about all the places she sees our Mom and how so many things remind her of her. I can absolutely agree with her sentiment and relate. I know that not everyone is as close to their Mom as I was to mine, so the struggle may seem strange to many. It is truly hard to describe how I feel, but I think there is a huge hole in my life and the void will never be filled. I am sure that over time things will become easier, but for now, everything is hard. I am not sure how I will ever get used to this "new normal". I am sure that I will continue to process in writing here, but I am also going to continue to share fashion, recipes and more. Thank you to each and everyone of you for your love and support, I read each comment and I am touched by your concern and your kindness. This skirt is so pretty! 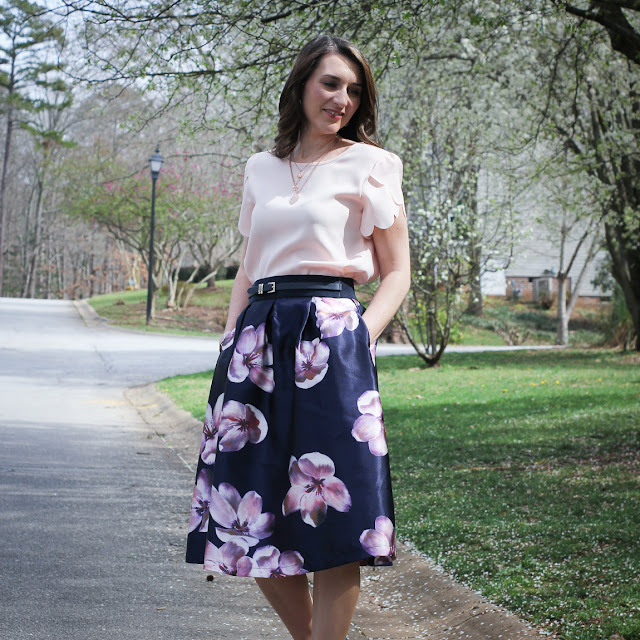 I definitely need it in my closet this Spring! What a cute skirt, I love the blush top with it. So sorry to hear about your mum's passing though. It's nice you can still find the joyful moments in life and find ways to have fun, she would not want you to be sad!